Chrome's sync feature isn't picking up all of the tabs open on my Android phone. Are the tabs stored in a file somewhere that I can access? My intention is to export the list of tabs so that I could run a factory reset on the device. I just managed to export ~400 tabs this way. 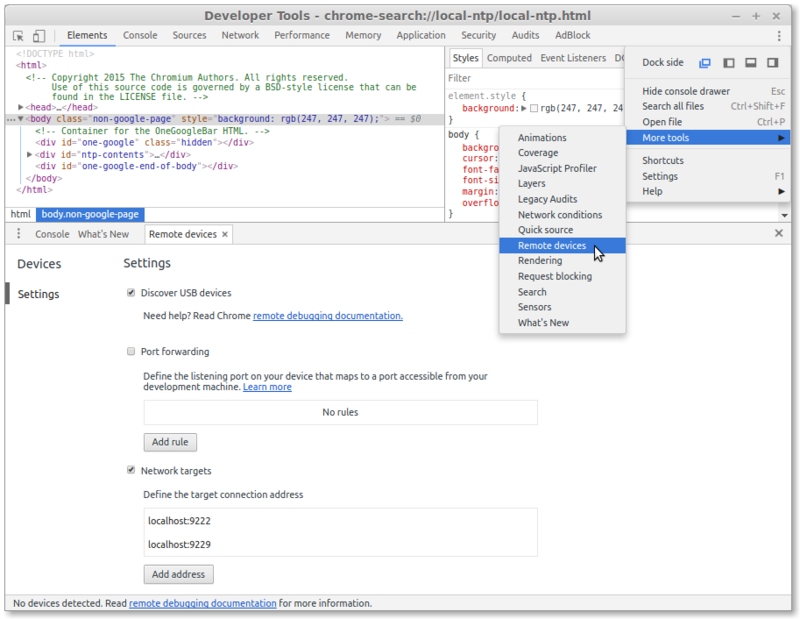 note that you must have devtools in pop-out mode (use the vertical ellipsis symbol in the top right of the panel) to be able to get this up, otherwise Ctrl+J(MAC) Ctrl+Shift+J(WINDOWS) will just close the first devtools panel. I came across this solution when I was looking to recover tabs that had been permanently closed after my browser crashed one day. In order to access the information you require, your device needs to be rooted so you can run a file explorer app with access to the root files installed on your device. ES File Explorer or Root Explorer are my recommendations. Navigate to the root folder of your device (the protected system partition) → select DATA → select com.android.chrome. There are several places where you may find information about your current tabs. The first folder to check is app_tabs, then 0. In this folder there should be a file called tab_state which contains a list of all your current tabs. There are also other files in this folder called tab3, tab4, etc. that contain info about current tabs. IMO, you need a special "text editor / sql editor" to read the content of some of these files as the encoding is different. Next place to look is /data/com.android.chrome/app_chrome/Default/. In this folder you'll find a file called History. Depending on your situation, you may find a good list of recent site visits here. Finally, navigate to the Sync Data folder. In here, you will find the information that's being synced to Google (and this should include all the tabs you currently have synced on other devices). In the file SyncData.sqlite3, you'll also find a history of all your Google searches (which I sometimes find to be an interesting read). You'll need an Sqlite3 data browser program on your PC in order to read this file. The app should be able to export to a highly usable .CSV or .XLS file that you can open in MS Excel. This could be helpful to someone I assume. 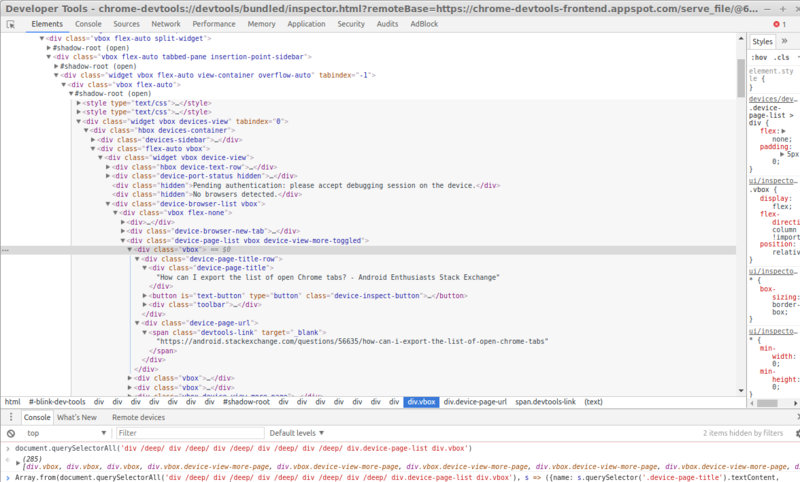 Execute adb forward tcp:9222 localabstract:chrome_devtools_remote on your development machine. The debugging protocol exposes JSON data about the chrome instance over HTTP. A JSON file listing the open tabs can be got by executing wget -O tabs.json http://localhost:9222/json/list. See here for more details on enabling USB debugging, and here for an overview of how it works. 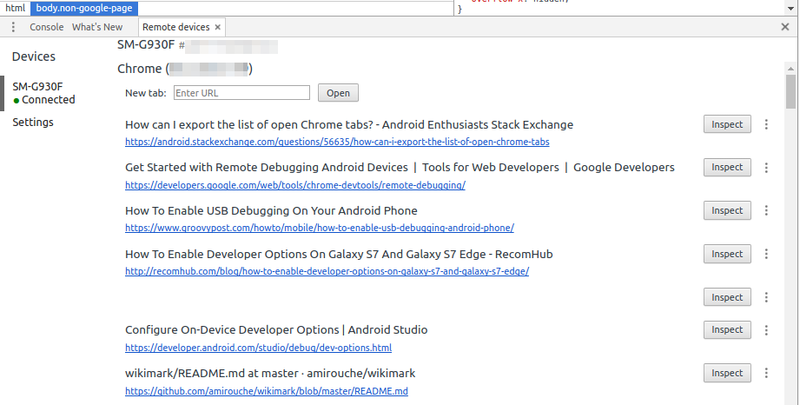 This workaround will give you a text file with individual URLs for all tabs you have open in Chrome for Android. This will modify the file with all of the URLs formatted correctly. Open the file as a text file and then copy and paste the contents into a Word document or some other location. For some reason, if you don't copy and paste the data out, when you save the file it erases all of the line breaks/carriage returns. If things screw up, just start over and do it again. When it's all said and done, you should have a file that contains a list of links to all the tabs you had open before. Michael identified the tab_state file, it remains to decode it. The following script worked for me (in kitkat KSH_VERSION='@(#)MIRBSD KSH R43 2013/02/19' or xenial BASH_VERSION='4.3.46(1)-release' on a tab_state file from Chrome 49.0.2623.105), it prints out the last URL first, between the URLs it removes any unprintable byte and all following bytes, and more if needed so at least 2 bytes are removed. Following each URL it prints a space, then the removed contiguous printable bytes if any, then a comma, then the number of other bytes removed (&said bytes within parentheses). To print the URLs only use the commented echo command instead. How can I conveniently save the urls of the opened webpages in https://www.google.com/bookmarks/? How can I export all my open Firefox Tabs to a text file? Where can I find the Chrome bookmarks stored locally in Samsung Galaxy S6? How do I recover chrome history when sync fails?